WASHINGTON — The U.S. Army’s effort to bring a Mobile Protected Firepower capability to infantry brigade combat teams — a near-term priority laid out in the service’s combat vehicle modernization strategy — has officially kicked off with the release of a request for proposals on Nov. 21. The service issued several draft RFPs to industry throughout the year to make clear what it is looking for, from base requirements to objective features. And several companies came forward during the Association of the U.S. Army’s annual conference in October with offerings while others remained tight-lipped. The Army has made clear it will skip the development phase in favor of commercially available vehicle options. Similar to how the Army procured its new Joint Light Tactical Vehicle, the service will have up to two companies build engineering and manufacturing development, or EMD, preproduction vehicles and will ultimately choose a winner. The plan is to award two EMD contracts during the first quarter of fiscal 2019, according to the RFP. Each contractor has to build 12 prototypes. Following the EMD phase, the Army will select a winner who will build up to a total of 54 low-rate initial production vehicles — 26 to start with an option to build 28 more. LRIP also includes retrofitting eight of the EMD vehicles. The Army notes in the RFP that it plans to equip the first unit with Mobile Protected Firepower, or MPF, in 2025. Proposals are due in March and bid samples by April 1. According to the RFP, funding available for the MPF program in FY19 will be $176 million. Subsequently, $311 million will be allotted in FY20, $360 million in FY21 and $376 million in FY22. The requirement for MPF is to provide infantry brigade combat teams a protected, long-range, cyber-resilient, precise, direct-fire capability for early or forcible entry operations. The Army has worked to engage industry from early on in the process, Maj. Gen. David Bassett, program executive officer for ground combat systems, said in a Nov. 22 Army statement. Industry has responded throughout that time by investing company dollars to bring potential designs “to level of readiness rarely, if ever, seen when procuring a new and highly complex combat platform,” the statement reads. The Army plans to take delivery of MPF prototypes within 14 months after contract award “and will get them into the hands of an evaluation unit four months after delivery,” according to the statement. So far, vendors that are expected to respond to the RFP are SAIC partnering with ST Kinetics and CMI Defence; BAE Systems; and General Dynamics Land Systems, but others could come forward. 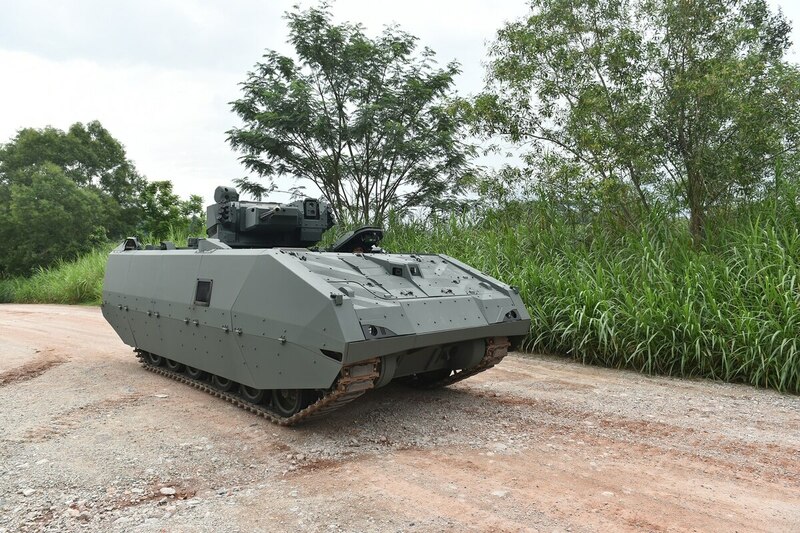 The SAIC, ST Kinetics and CMI Defence team said it will integrate CMI’s Cockerill 3105 turret onto an ST Kinetics next-generation armored fighting vehicle chassis. BAE Systems is offering an M8 Buford Armored Gun System with new capabilities and new modernized components. General Dynamics Land Systems said it plans to respond with an offering, but the company has not been forthcoming on what it might bring to the competition. It’s theorized that the firm will bring something stemming from its Griffin demonstrator it brought to AUSA in 2016 that combines a 120mm cannon designed for the defunct Future Combat System and the British Ajax chassis.